Morgan Edelman (3) goes up for the kill against the Bridgewater-Emery Huskies during the Wolves’ final match in the Region 5B Volleyball Tournament in Emery Thursday evening, Nov. 1. 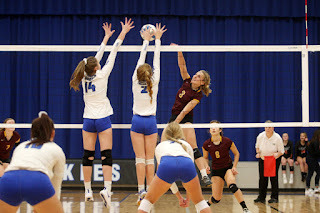 The Wolves fell in four sets, ending their 2018 season with a record of 12-15 record. The Wolves had defeated Gayville-Volin in five sets earlier in the tournament. See page 6 for more on the Wolves' performance at the region tournament.